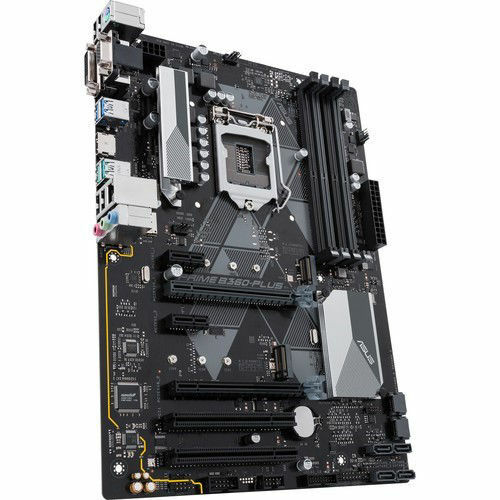 Powered exclusively by 8th Generation Intel Core processors, the Prime B360-Plus LGA 1151 ATX Motherboard from ASUS supports the Intel B360 chipset and the LGA 1151 socket. It delivers customizable performance in ATX cases and is compatible with DDR4 memory, plus HDMI, DVI, and VGA display outputs. 5X Protection III with FanXpert 2+ provides hardware-level safeguards, CrossFireX technology supports multiple GPUs, M.2 and USB 3.1 Gen 2 maximize connectivity and transfer speeds, and 8-channel HD audio produces warm and immersive crystal-clear sound. This motherboard is protected by a limited 3-year warranty. Designed exclusively for 8th generation Intel Core processors to maximize connectivity and speed with integrated dual M.2, Intel Optane memory compatibility, and USB 3.1 Gen 2. 5X Protection III hardware-level safeguards help provide component longevity and reliability. ASUS OptiMem improves memory stability and performance by improving trace isolation between PCB layers to maintain signal integrity, even at higher frequencies. Onboard 8-channel HD audio provides warm, immersive crystal-clear surround sound.